Now there are so many incredibly useful sorts of makeup brushes out there, but not every last one is necessary to your collection. This foolproof makeup brush guide covers just the need-to-know basics. Keep scrolling to learn which brushes are worth having in your collection and how to use them! 2. It applies your foundation more evenly and precisely. 3. You don’t waste any foundation on your fingers. 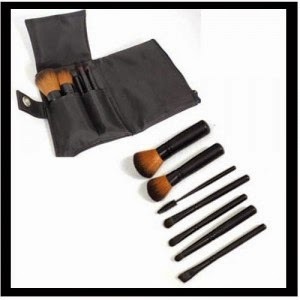 The powder brush is one of the largest makeup brushes and has a wide variety of purposes. It is soft, full and rounded, allowing it to easily pick up powdered products. You can use it to distribute powder evenly to large areas, such as the face, neck and décolletage. Simple pat the brush into your powder product, dust off any excess and apply using sweeping and circular motions. If you’re a big fan of bronzer, this brush is a must. This brush may be little, but when used correctly the impact it makes can be huge. We’re always told to pat in concealer not rub, but this can be difficult when applying with your fingers. Use this brush to gently pat on your concealer for smooth and flawless coverage. Whether it’s dark circles under your eyes, spots or discoloration, this nifty little brush will give you more control over those annoying imperfections. That’s right you guessed it, a blush brush is used for applying your blush. The blush brush is made with fine, gentle fibers with a soft rounded head. It’s ideal for applying powdered color to the apples of your cheeks and blending it up along your cheekbone. Don’t forget to smile& dab so you can locate them better! For the KIM K-West look this is the brush that can help you achieve it. The slanted bristles are intended to mimic the angle of your cheekbones, so it’s perfect for blending, highlighting and shading using a bronzer or illuminating powder. There are many different types of eye shadow brushes, but the two most commonly used: The eye base brush is used to apply color to your entire eyelid. It’s wide, flat and short, with a beveled edge to allow smooth application without pulling on the eyelid. Once a base color has been applied, the angled eye shadow brush or contour eye shadow brush is then used for layering color and creating hard lines along the eyelid crease. A lip brush is a great way to achieve a perfect line when you don’t have a lip liner handy (or can’t find the right color). The sculpted tip of the lip brush allows for precise application and lining of the lip, while the short and firm bristles gives flawless overall coverage. It’s also a more hygienic way to apply lipstick if you tend to share. Treat your brushes the way you would your skin! Clean after each use, dry properly and store in a safe place. Don't just throw them loosely into a makeup kit. Not only can the top get crushed and distorted, but also a serious amount of germs live deep in the depths of your bag and can rub off onto anything in close proximity. Instead, stay organized and most importantly safe. I suggest using a gentle shampoo like the baby variety to wash the brushes. Make sure the word "gentle" is clearly printed on the label to avoid harsh chemicals that can loosen the glue holding bristles in place. Softly scrub the lathered up brushes in the palm of your hand and then rinse thoroughly until the water stream runs clear (a sign that dirt and makeup have made their exit). Then lay them flat on a paper towel to dry overnight.